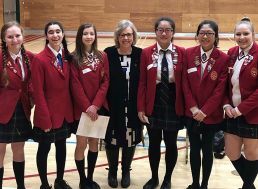 On Monday, January 21, 2019, Elizabeth May, leader of the Green Party of Canada, visited St. Margaret’s School as the distinguished guest of honour for a Q&A with Senior Year students. May candidly discussed the state of Canadian democracy, the health of parliamentary institutions, the results of climate negotiations, and almost everything else of consequence crossing the Canadian social, political, or environmental radar, including her thoughts on Prime Minister, Justin Trudeau. 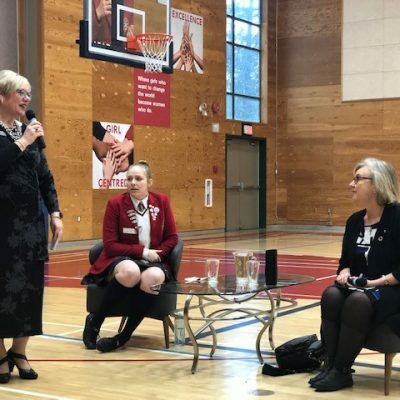 “It’s always inspiring to meet with young women who are confident, well spoken, inquisitive and intelligent—which is continuously the case when I come to St. Margaret’s School,” said May. Elizabeth May is the Green Party of Canada’s first elected Member of Parliament, representing Saanich-Gulf Islands in southern Vancouver Island. She is an environmentalist, writer, activist and lawyer, who has a long record as a dedicated advocate for social justice, for the environment, for human rights, and for pragmatic economic solutions. During the discussion, May answered questions on a variety of complex topics put forth by a panel of Senior Year students, including her position on the legalization of marijuana, climate targets, proportional representation (PR), and the legal voting age. 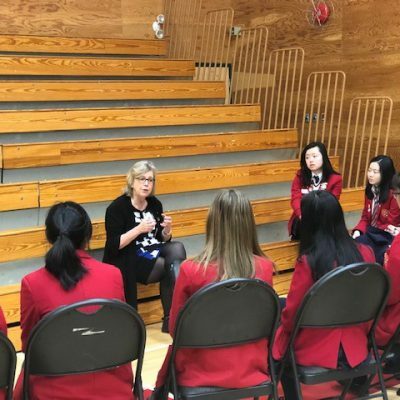 After the panel discussion May, who holds a law degree from Dalhousie University, sat down for a more intimate conversation with the Grade 12 Law class. The girls took a deeper dive into issues that affect the current environment, such as renewable energy and the Pipeline debate—an experience that no doubt, opened their eyes to a more informed perspective on these national issues. 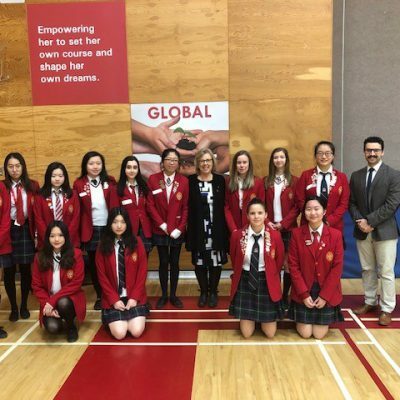 “It was an honour to have her (May) here, I personally took a lot away from this experience, and loved hearing her response to our questions—especially the part about Justin Trudeau,” said Deputy Head Girl, Alix Corwin, who lead the panel discussion. SMS is always looking to provide students with opportunities to connect with inspirational leaders, and empowering women, and this is yet another example of our values in action.